I’m one of the last folks still using a Blackberry phone. OK, call me antiquated, but it works for me. And I was one of the folks who bought the Blackberry Playbook within days of its release in April 2011 . The tablet has served me well. Nonetheless, I picked up an iToy – so named because I think of it as a toy, plus I’d rather not invite even more spam bots to the blog – in early December to see what the fuss was about. At some point, I intend to write up my thoughts; for now, let’s focus on a common piece of software. I’m a list maker. Being someone who’s life is really, really busy, the only way I can work efficiently is to be highly organized. 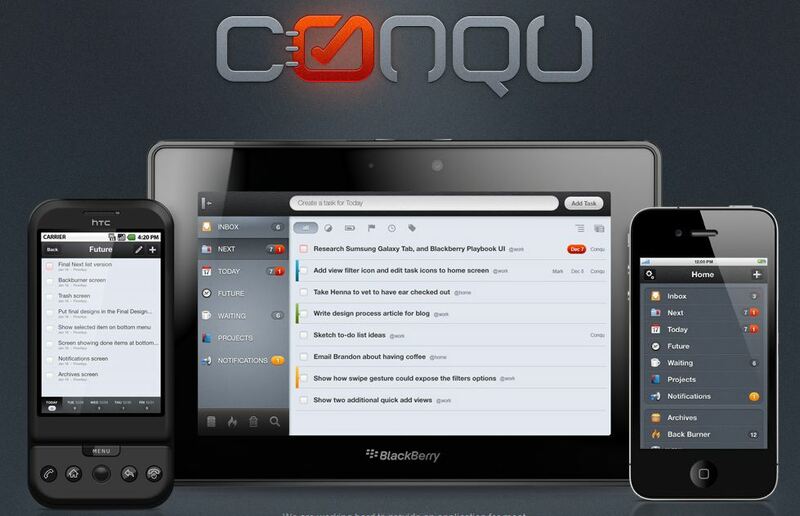 One of the first pieces of software I downloaded for my Playbook was Conqu. Using it was a joy, so when I picked up LaToya, I was pleased to discover that the same software was available for it. Best of all, the software is free. One of the things I had not done was to download the desktop software. After all, having on Matilda, my Playbook, was just fine since she’s never far from my reach. But with the addition of LaToya, I knew I had to give synchronization a try. Honestly, I didn’t need the 14-day free trial of the synchronization. As soon as I signed up, I saw the benefit of having my lists almost everywhere. (There is not a version for my Blackberry phone yet.) Between my tablets and my computers, I can jot down things as they arise. Checking the status of projects, making notes on what has been done, what needs to be done – all are a breeze. Even without an app for my phone, I can add tasks to the list by email or use my phone’s browser to access my tasks list online. If you subscribe to the theory of GTD, take a look at Conqu. Best $53 I’ve spent in a long time. And no, I’m in no way affiliated with Conqu nor have I received any compensation for writing this. I’m just a happy customer. I use gmail. Synchs at the speed of light on all devices getting a signal. I’ve not really gotten into Google’s suite of products. Does it do to-do lists? I’m a big fan of the Evernote platform. Native clients for Mac, Android, & Blackberry (also broswer-accessible). Syncs everything (which is then available offline). Free for the first couple of GBs per month, paid raises the cap. Very flex (among other things, I use it for my own modified GTD system). I’ve tried Evernote – just doesn’t work for me. But I know a lot of folks swear by it. I’ve just gotten Evernote. I got a Sony tablet for Christmas to go with my Galaxy S3 phone. Haven’t used Evernote much yet, though.